Blooms of Life is a series of 8”x 8” acrylic floral paintings by renowned Canadian artist Jeremy Bortz. Each piece is uniquely hand-painted with the artist’s choice of colour and inspiration from nature. Put together as 5 x 5 plots, Blooms of Life will fill Yee Hong with “gardens” of joy, vitality, and tranquility, for our beloved seniors. 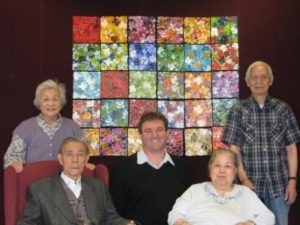 For a donation of $800, you can dedicate a floral painting at one of the designated locations within Yee Hong Centre, with your name or that of your honoree recognized adjacent to the plot.